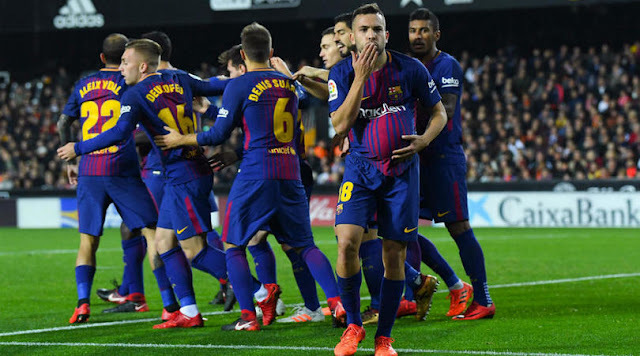 Jordi Alba scored a late equaliser and Lionel Messi had a goal controversially ruled out as Barcelona drew 1-1 against Valencia at Mestalla on Sunday. The full-back marked his 200th start for the club by meeting Messi's cross to volley past Neto as Ernesto Valverde's side preserved their four-point cushion at the top of La Liga. The game will be remembered, however, for the match officials' failure to award Messi with a first-half opener after the Valencia goalkeeper spilled his shot a yard over the line. Rodrigo subsequently gave Valencia the lead on the hour mark after he met Jose Gaya's low cross to score from close range but the hosts could not hold out as Alba struck to ensure a share of the spoils. Valencia: Neto (5), Gaya (7), Garay (7), Gabriel (7), Montoya (6), Kondogbia (7), Parejo (7), Soler (6), Guedes (8), Rodrigo (7), Zaza (7). Barcelona: Ter Stegen (6), Semedo (6), Alba (8), Umtiti (7), Vermaelen (6), Paulinho (6), Busquets (7), Rakitic (6), Iniesta (6), Suarez (7), Messi (7). The result means both Valencia and Barcelona preserve their unbeaten record in La Liga this season, but the only incident of note in a cagey opening 45 minutes will leave the Spanish football federation questioning the continued absence of goal-line technology. After Paulinho and Ivan Rakitic had tested Neto with long-range efforts, Barcelona felt they broke the deadlock as Messi met Luis Suarez's cross to fire a left-foot shot first time that was spilled over the line by Neto. As Messi wheeled away in celebration, the Argentine could not believe his eyes as Valencia broke down the other end and very nearly scored through Simone Zaza with several Barcelona players caught up the pitch. Valencia made four changes to the side which beat Espanyol as Ezequiel Garay, Carlos Soler, Goncalo Guedes and Simone Zaza all started. Barcelona handed Thomas Vermaelen a rare start in for the suspended Gerard Pique while Lionel Messi replaced Gerard Deulofeu. Referee Iglesias Villanueva waved away the protests as the score remained goalless at the interval, but Valencia emerged for the re-start feeling like the incident had served its purpose as a wakeup call. Marc-Andre ter Stegen, who had been a virtual spectator in the opening period, was forced into saving at the feet of both Goncalo Guedes and then Rodrigo, but there was nothing he could do about Valencia's opener. Jose Gaya broke free of Nelson Semedo down the left and his fierce cutback was tapped in by Rodrigo after Thomas Vermaelen - on his first La Liga start in 22 months - had switched off. Valencia were in the ascendancy, and holes began to appear in the Barcelona defence as they went in search of an equaliser, but Valverde's bravery was rewarded with eight minutes remaining. Messi collected the ball in a deep position before showing superb vision to spot the run of Alba around the back of Martin Montoya, and the full-back finished with aplomb firing an unerring volley past Neto from an acute angle. The Portuguese winger enjoyed a fine game on the left for the hosts with his direct runs troubling Nelson Semedo and forcing his compatriot to go backwards rather than enjoying his natural game. Guedes combined well with his full-back Jose Gaya at regular intervals, and he was unfortunate not to pick out Rodrigo following a good run before Valencia did find the opener. Such was the 20-year-old's impact, Barcelona manager Ernesto Valverde felt obliged to make a defensive substitution as his side went in search of an equaliser with the tiring Semedo replaced by Aleix Vidal. Guedes has been touted as one of the best youngsters in Europe this season and this was another powerful demonstration of his undoubted ability.